Besides distributing Internet resources, APNIC also contributes to the community by coordinating various training activities relevant to maintaining IP resources, routing and network security. 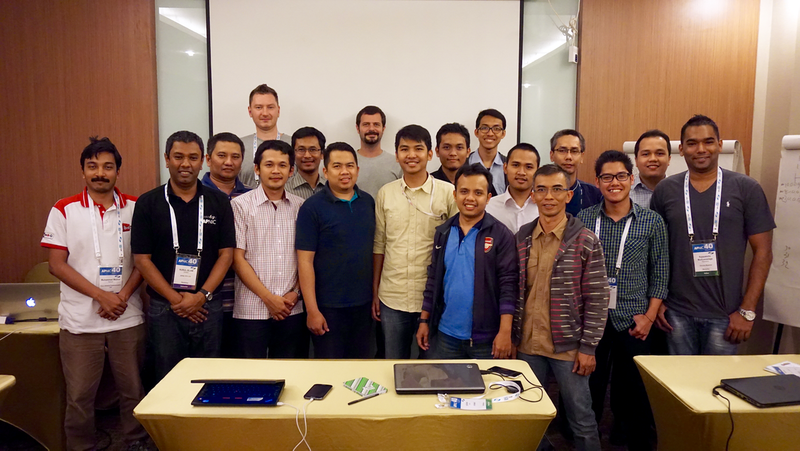 I was the first Community Trainer appointed by APNIC in 2015 to help expand the coverage of its training efforts in the Asia Pacific region. Given the sheer size of the region, spanning from the Pitcairn Islands in the Pacific to Afghanistan, it is near impossible for a handful of APNIC trainers to cover this area alone. Besides this logistical issue, there are also language and cultural barriers, all of which have led to the APNIC Community Trainer program, which seeks to recruit local trainers to train local communities. Below is a short post on my experience to help future volunteers decide if they’d like to join the program too. The process starts with an invitation from the APNIC training team. They will request for your availability on certain dates and check whether you are able to cover the topics. As part of the agreement you will discuss working days and you will have to sign a Non-Disclosure Agreement for the resources that will be used in the delivery of the training. Once the paperwork is done it is time to organize your travel and if necessary apply for a visa. Although the program focuses on having local trainers training local people there may be instances where you might have to assist in other economies in your sub-region. Someone from the APNIC travel team will assist with arranging your flights and accommodation. As a current expert working in the field, you’ll be encouraged to help develop and keep course content up-to-date. APNIC will provide you with the majority of content and all hardware resources required to do the training — in my case it was a Mac Mini and one wireless router but this varies depending on the training workshop. You therefore have nothing to worry about regarding the hardware, training materials and other resources. APNIC training workshops usually run anywhere from three to five days and with an extra two days for travel. Normally I travel light — I have three backpacks — a 16L/24L/36L — which I use for my five-day, 12-day and 21-day trips. For a 7-day trip I normally travel with my 24L backpack. This saves having to check-in baggage, which means there is nothing to worry about regarding lost luggage. Figure 1 — As a Community Trainer from Bangladesh, I have conducted training sessions in Bangladesh, as well as Nepal, Malaysia, Indonesia and Taiwan. 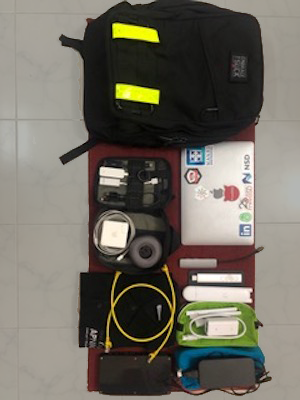 Apart from the equipment provided by APNIC, I also like to use my own equipment during the training sessions, mainly because I’m comfortable with being able to configure and troubleshoot it. It’s important to clarify that this is only my preference and ultra-careful nature — APNIC will provide you with all the gear you’ll need to. I admit that the amount of storage is a bit of an overkill as a 1 TB M.2 module is enough. However, having two offers redundancy and due to my other requirements, I have the dual hard disk setup. For wireless access to the lab I use an Ubiquiti AC Mesh Wireless Access Point. First of all, it is really easy to carry (it is slightly wider than a fat pen) and has been compatible with over 120 devices so far via 2.4 and 5 GHz channels. For the software stack I use Vmware vSphere Hypervisor — check their website to see if you are eligible for a single instance free license. I use OPNSense as an open source firewall router to connect to the Internet and the local area network (LAN). The Intel NUC has a single ethernet interface, therefore, I use it to connect the LAN using the Access Point and use the TP-Link USB ethernet to connect to the Internet. I use two different VLANs in the vSphere Hypervisor switch to isolate the Internet and LAN: the OPNSense router is connected to both of the VLANs, while the necessary VM for the training is connected to the VLAN for the LAN. One more benefit of running vSphere Hypervisor is that in the unlikely case the NUC fails I can bring the VMs in my Macbook Pro (2C/16GB) and run it instantly without any headache — just a bit of professional paranoia but it helps to be prepared for the worst case. There is always a possibility of failure, so being prepared doesn’t hurt too much. This is my setup and really doesn’t take too much space to carry. Moreover it gives you inner peace and confidence while using and controlling it. It is important to remember that there is a possibility that attendees have never met a more experienced person than you in their entire career, hence there will be a higher expectation from them. Be patient and try to help them address their practical problems in their work place during the coffee and lunch breaks. One last thing worth noting is that for 90% of attendees English is not their first or, in many cases, second or third language. In some cases, you will need to work with interpreters or attendees who have a good grasp of English and the local language — everyone will be helping you out if you don’t know their language and culture. In worst-case scenarios, I’ve found that getting people to draw their problem on a white boards and big sheets of paper can help to break down the language barrier. Figure 3 — Getting people to draw their problem on a white boards and big sheets of paper can help to break down the language barrier. Once the training has finished you’ll be required to write a report on the workshop and advise on the overall experience and subject matter, including validating the content for future use. The entire experience does take time, so it helps if you have a good relationship with your boss and are flexible with your time. The rewards, though, are really worth it, particularly when you can leave a workshop knowing that you’ve contributed in a small way to improving the Internet in that part of the world. I look forward to hopefully welcoming you as a Community Trainer in the future and if you have any further questions about the program, don’t hesitate to leave me a message below. Visit the Community Trainers Program webpage, or register an Expression of Interest today. Moinur Rahman works for DZCRD Networks Ltd. 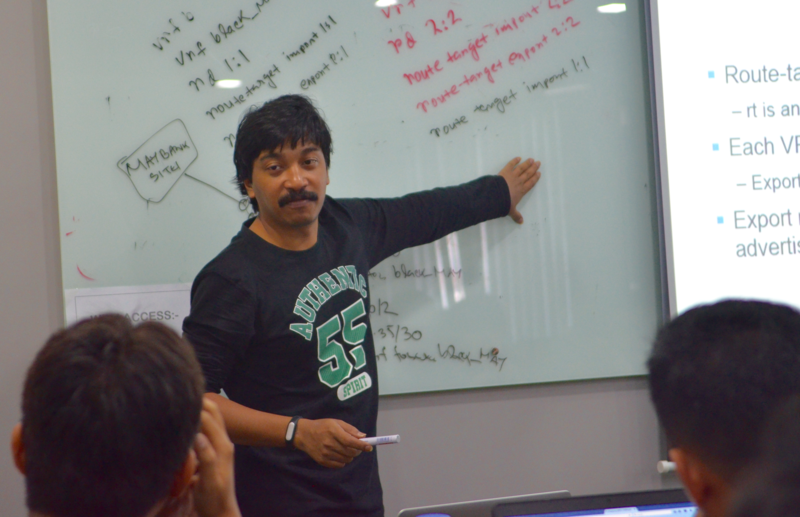 He is a regular contributor to APNIC training activities and shares his knowledge as a volunteer community trainer. Nice article and thanks for sharing your experience. Will definitely help me with prep for future workshop. He ia a real boss. I saw him very closely..
Mr. Moin has the right attitude over every thing which makes him a leader. His spectacular growth in his career describes the dedication he puts. ‘Complete versatile human being’ the adjective suits with him. Its my honor that i have worked with home closely.